This detailed look at creating a prop kidney comes to us from Eduardo Talbert of Monster Tutorials. The technique, using a latex skin over heat formed polyfill, is equally adaptable to making all sorts of organs and fleshy bits. The ocean's tidal zone is filled with life, but one rarely finds creatures that present a threat to humans. 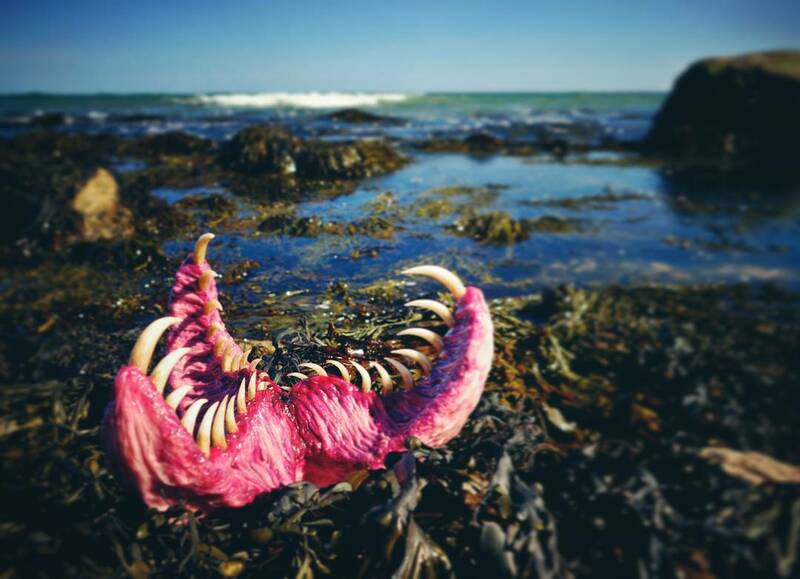 Karen Main returns to our pages with an unusual specimen just waiting to feed on whatever might pass by. 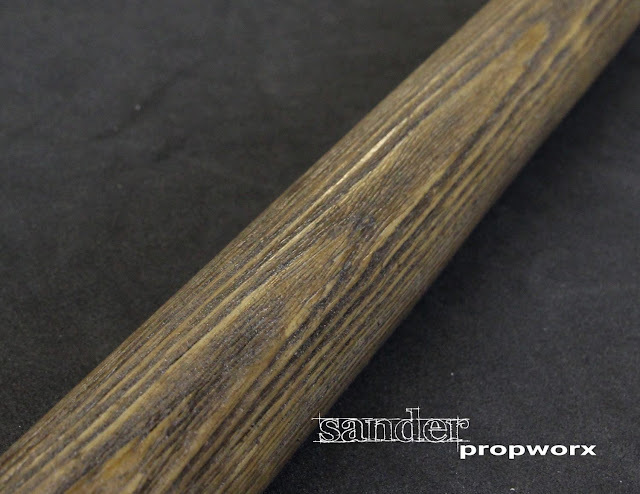 Sander Propworx returns to our pages with this combat safe LARP spear. 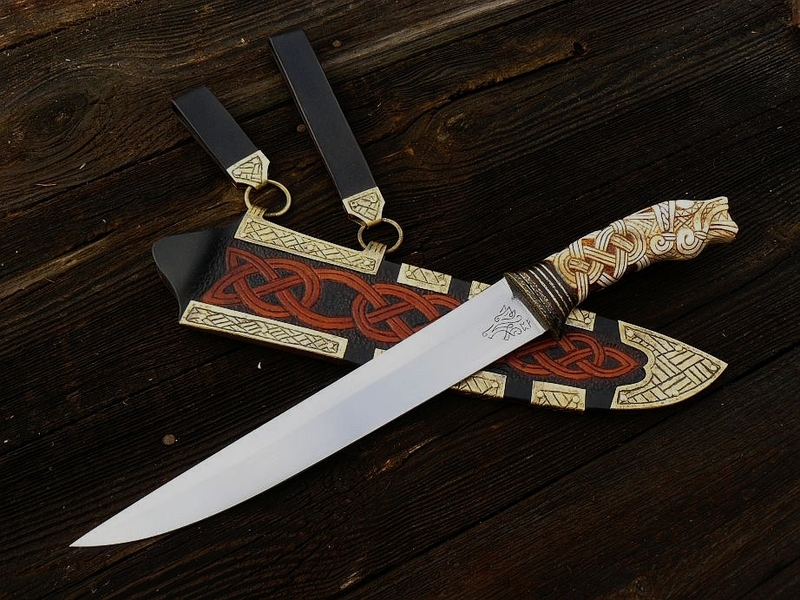 The finish is so good it's hard to believe this is foam. 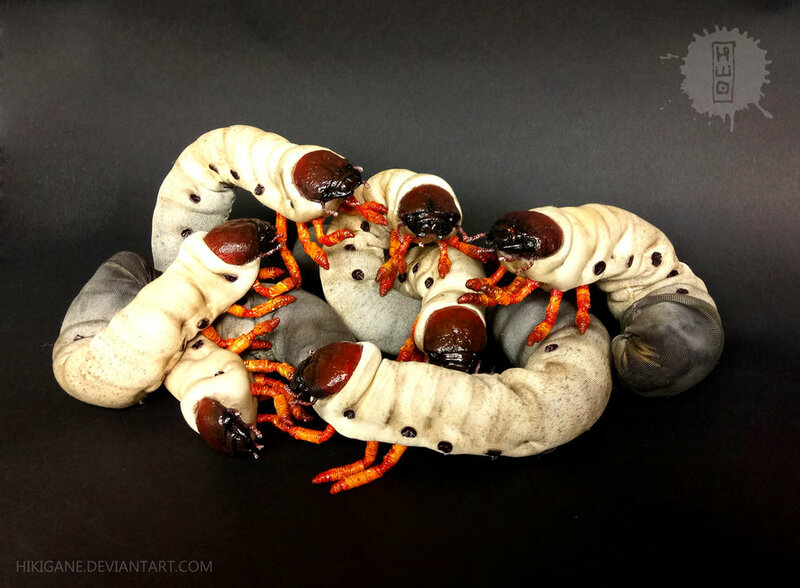 Hungarian artist Boglarka Zilahi brings us this collection of plump, happy grubs. 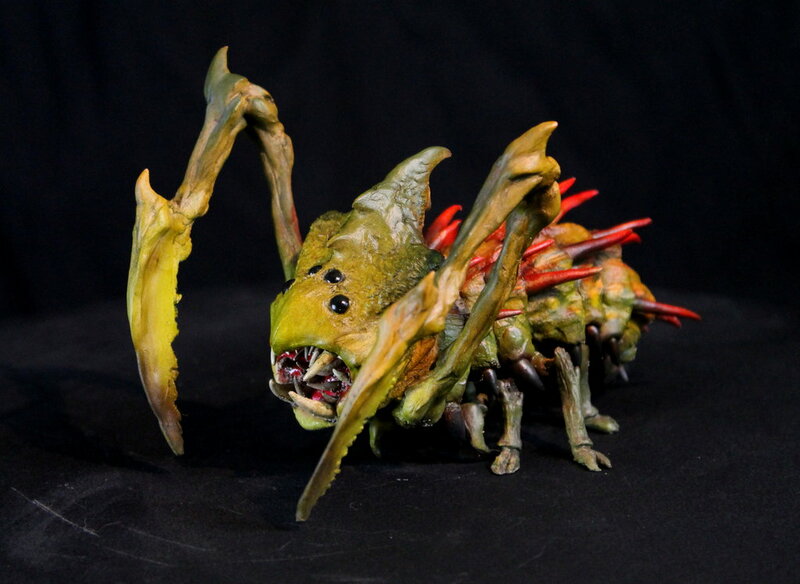 Surprisingly, the little beasties are sculpted from fabric and filler. 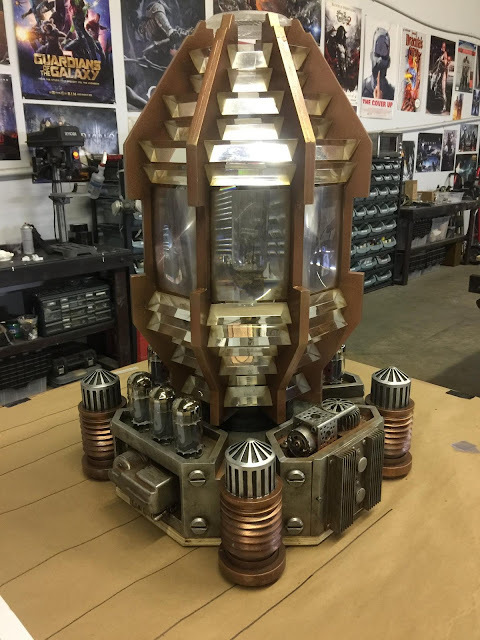 Professional prop builders Hex Mortis created this ornate "Hell Device" for the latest season of "Preacher". The gallery documents the full build, including the practical lighting effects incorporated into the mechanism. 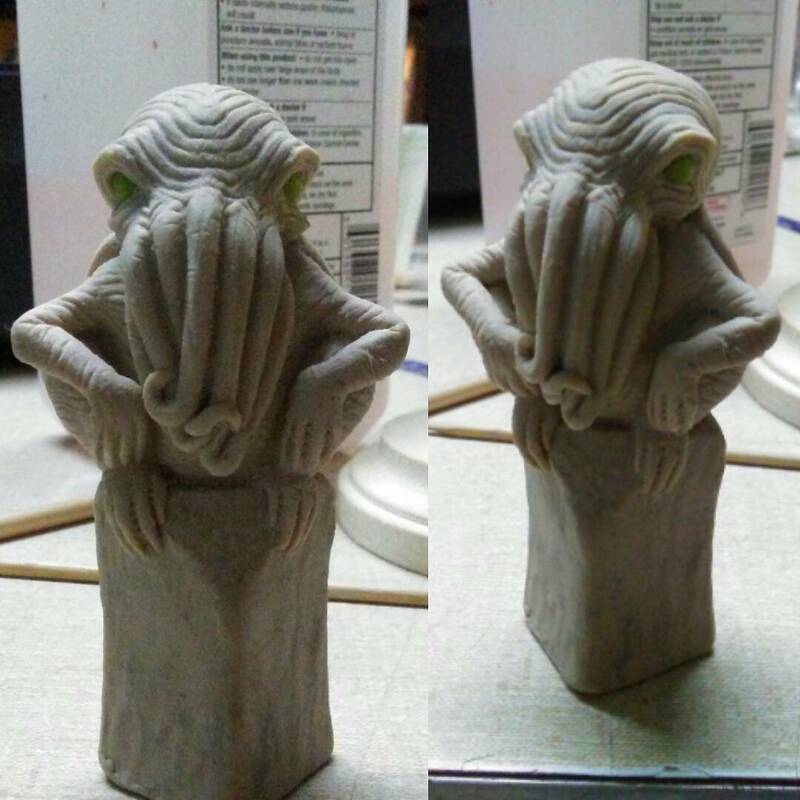 Artist Sam Sturgeon serves up his take on the traditional Lovecraftian Cthulhu idol. 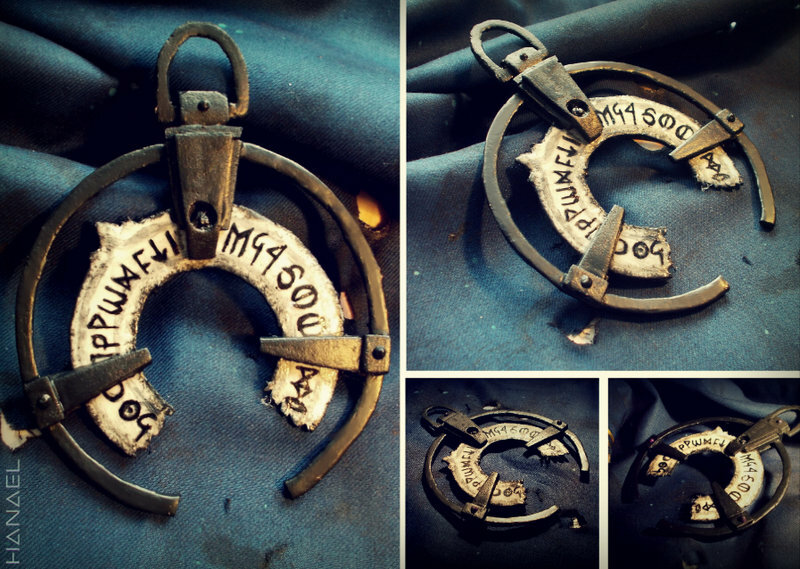 Hanael Cosplay brings us this recreation of the black bonecharm from the "Dishonered" video game franchise. This cast metal amulet bearing the Hunter's rune comes to us from artist Mariana Martins. 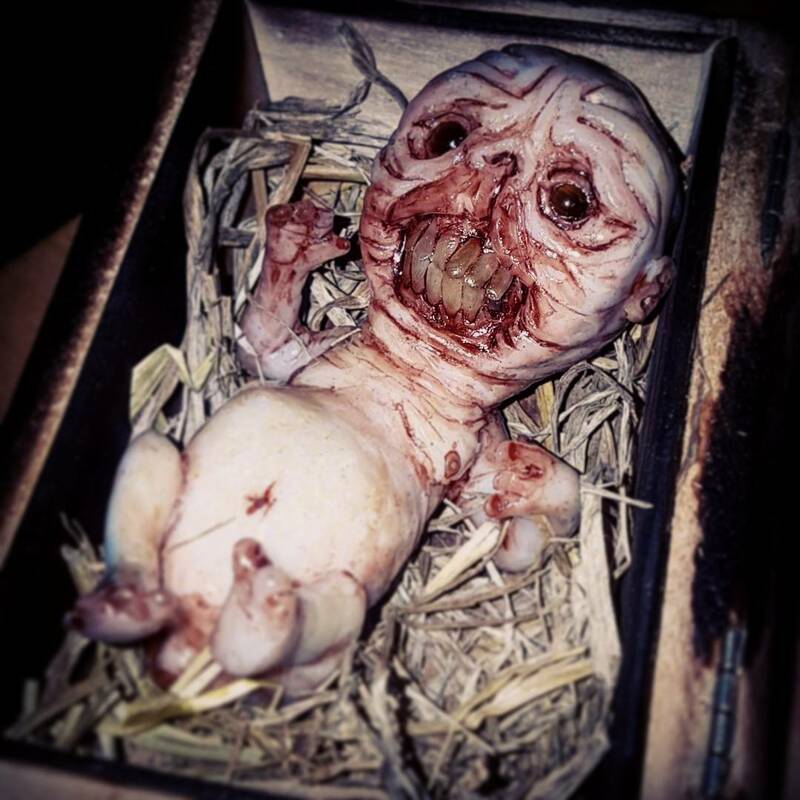 This horrific bit of fetal ickyness comes to us from Swedish artist Joen Bager. 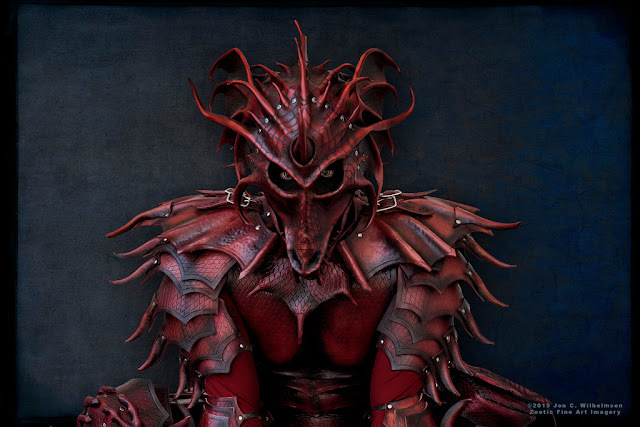 The appropriately named Red Dragon Lord is responsible for this set of handcrafted leather Red Dragon Armor. 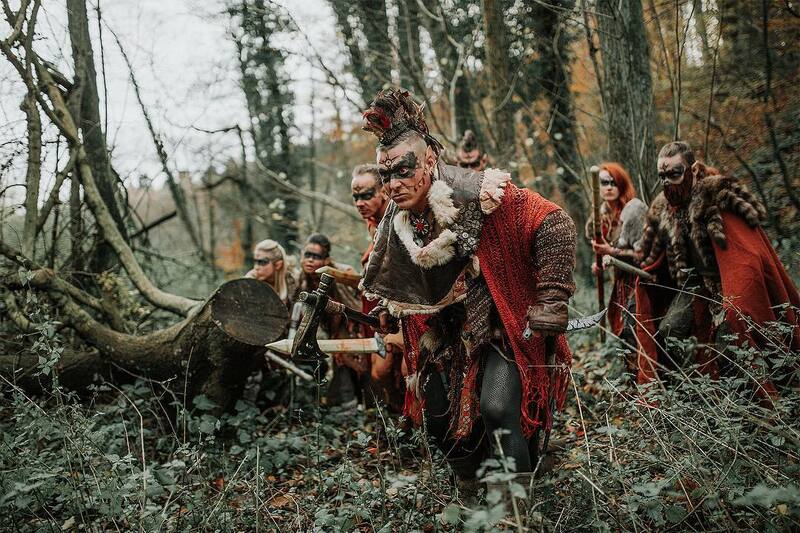 Photography by Zoetic Fine Art Imagery. 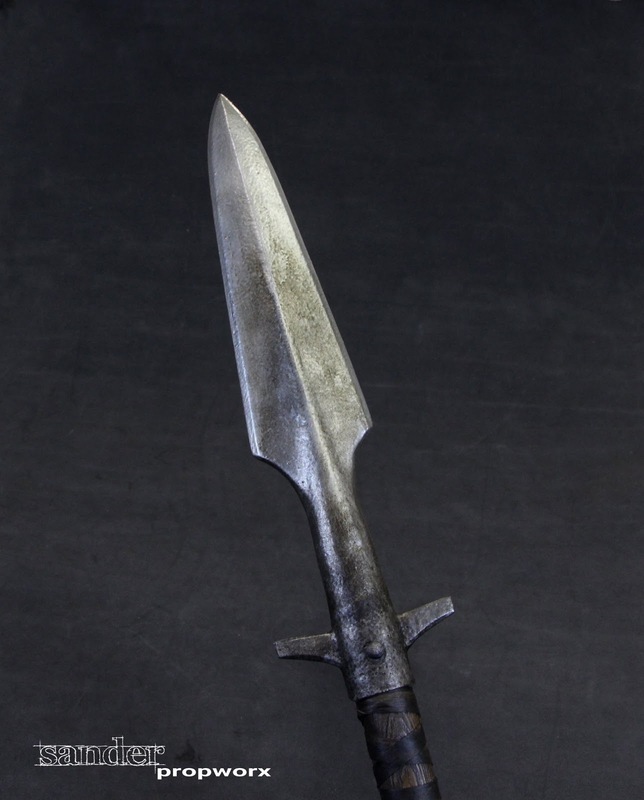 This massive 16" vampire killing stake comes to us from Fringe Walker Studios. 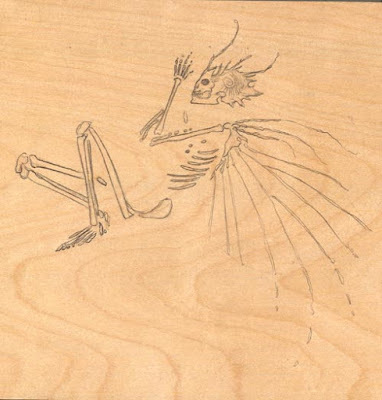 When you absolutely, positively don't want them getting up out of that casket ever again. 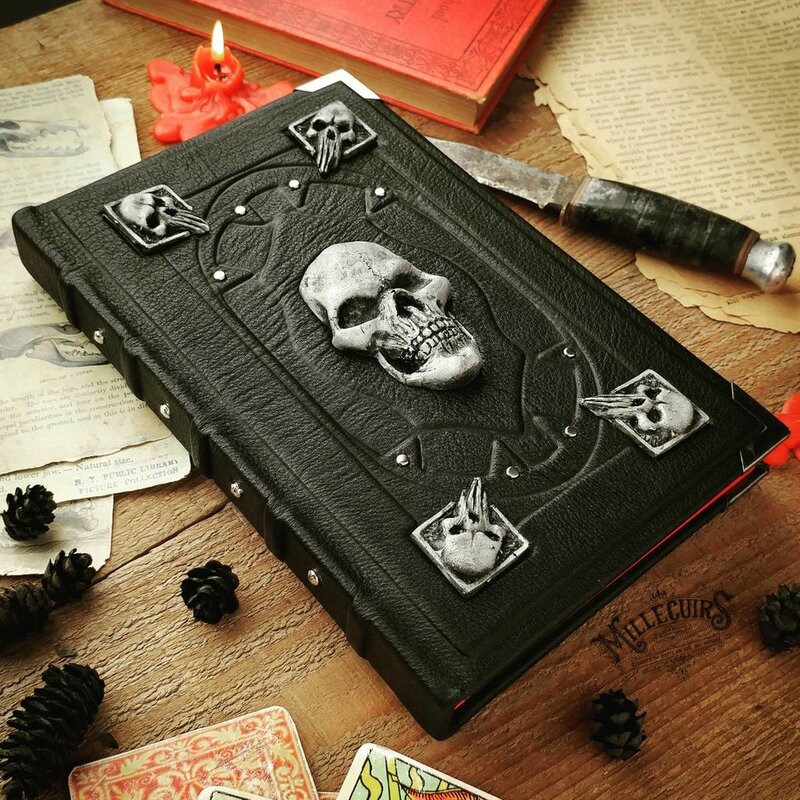 Alex Libris returns to our pages with another masterful example of the bookbinder's art. 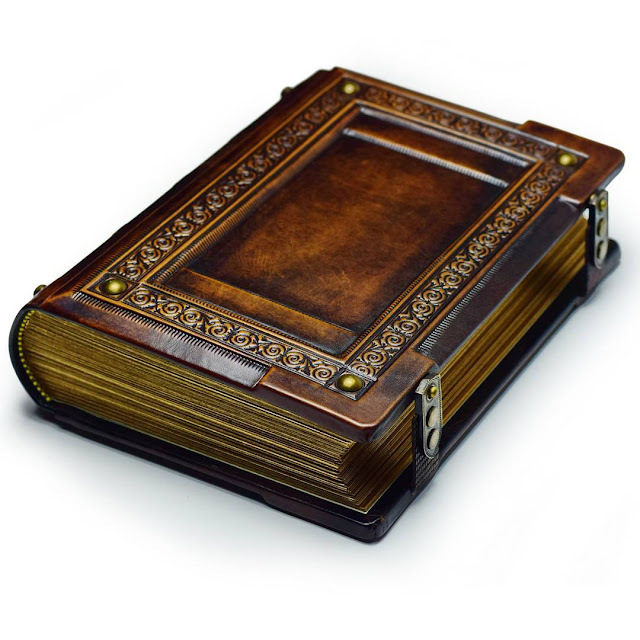 This handcrafted tome features tooled leather and custom hardware. Professional knife maker PrzemoSremo brings us Freki, a Viking-inspired blade complete with tooled sheath. 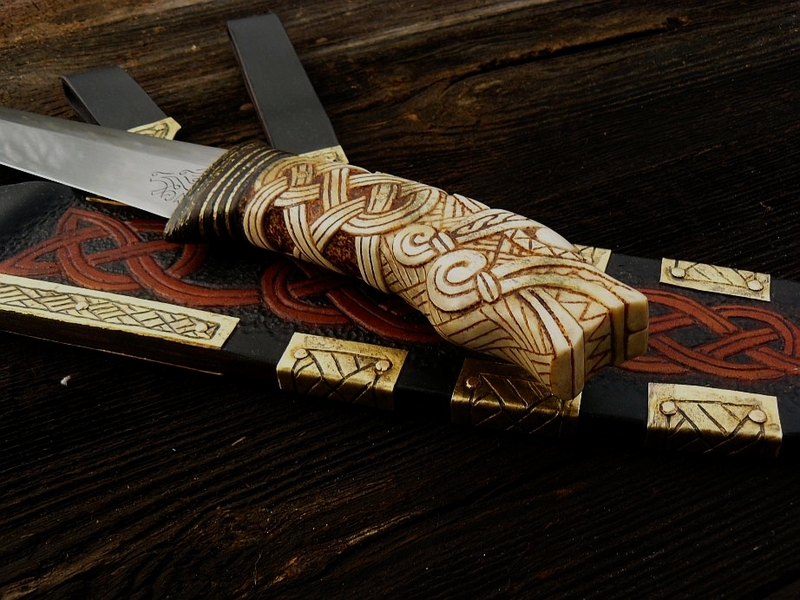 The hilt is carved from moose antler. 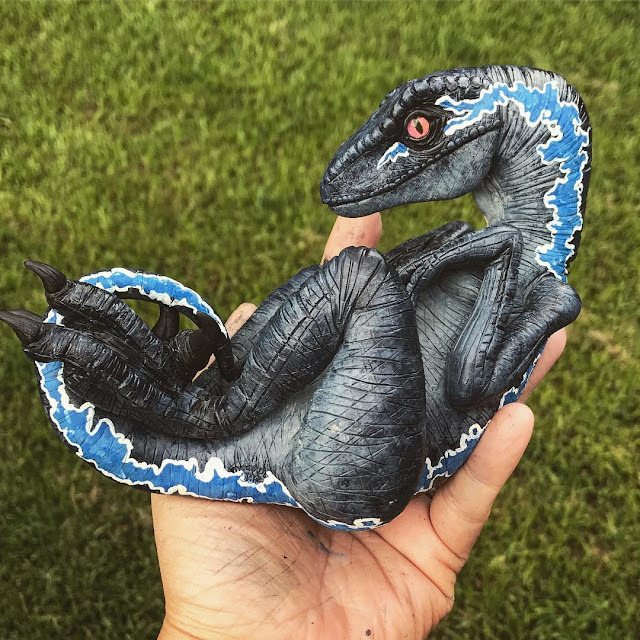 Ericka Cummings returns from Isla Nublar with this freshly hatched velociraptor. They grow up so fast, don't they? 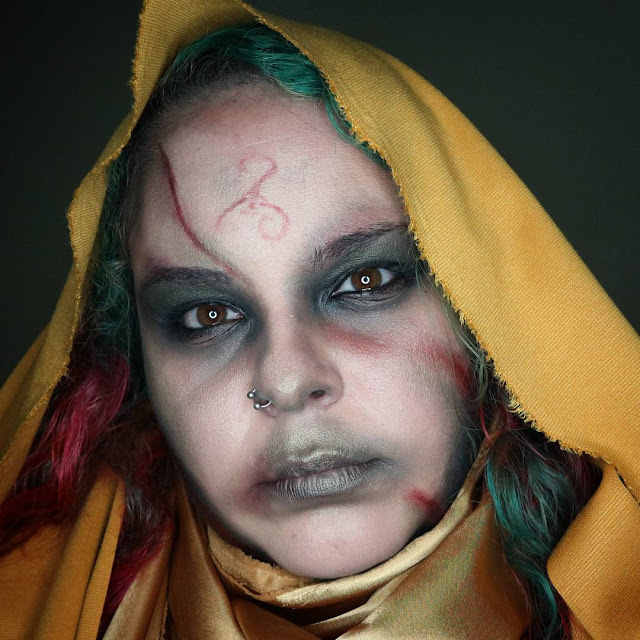 Makeup artist Saray Segoviano brings us her take on a cultist in service to the King in Yellow. The reflection of the ring light in her pupil ups the creep factor considerably. This is insanely cool. The "Die Blutelfen" LARP group is dedicated to roleplaying a tribe of blood elves, with an emphasis on "dedicated". 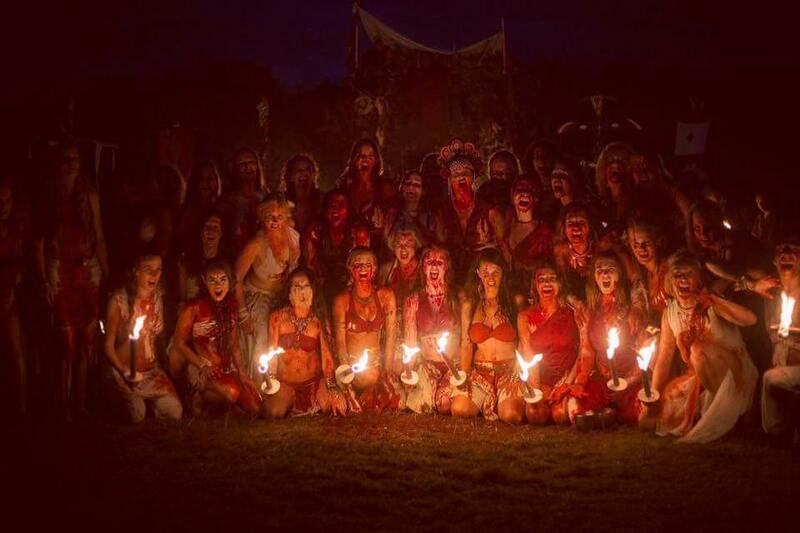 Their Facebook page is filled with photos detailing the group's ornate costumes, event camps, and even a peek at their rituals. It's gloriously over the top. 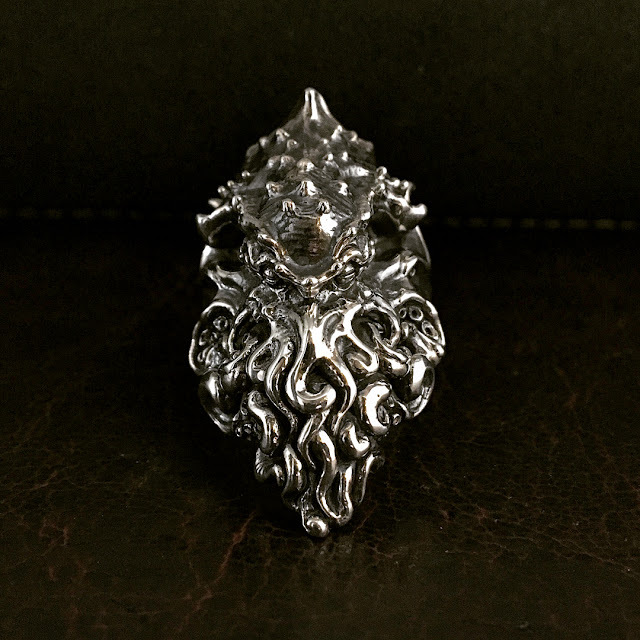 This beautifully sculpted Cthulhu ring comes to us from Japanese jewelers Silver Shield. 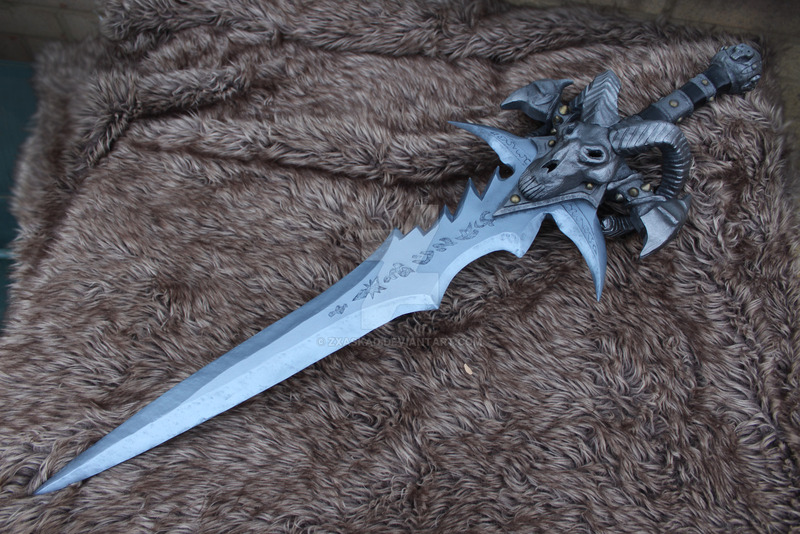 Zxaskad brings us this detailed recreation of Frostmourne from the "World of Warcraft". The sword was carved from wood and then detailed with apoxie sculpt. 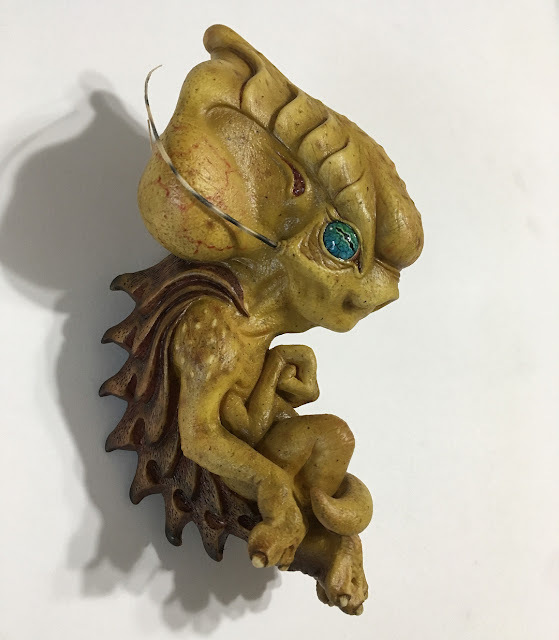 This alien fetus comes to us from Brogan Paul Johnson. I believe the tendrils are African porcupine quills. The talented Mille Cuirs returns to our pages with the Necromancer's Grimoire. 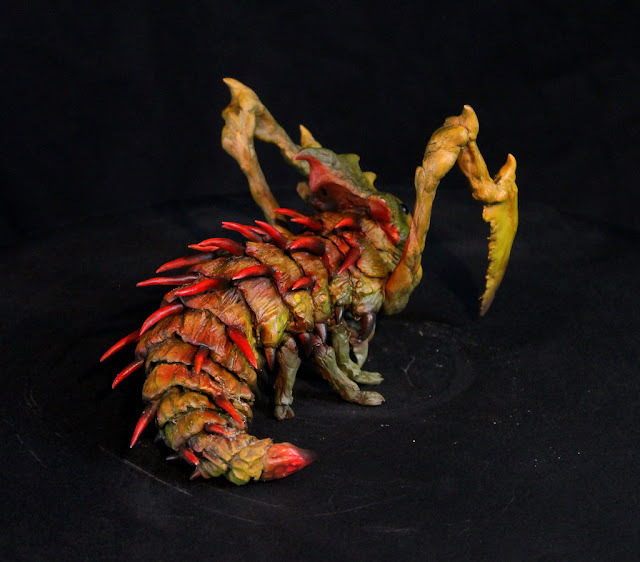 This specimen of the spiked lurker beetle comes to us from Ravendark Creations. Sculptor Yoneyama Keisuke brings us this very alien take on Cthulhu. 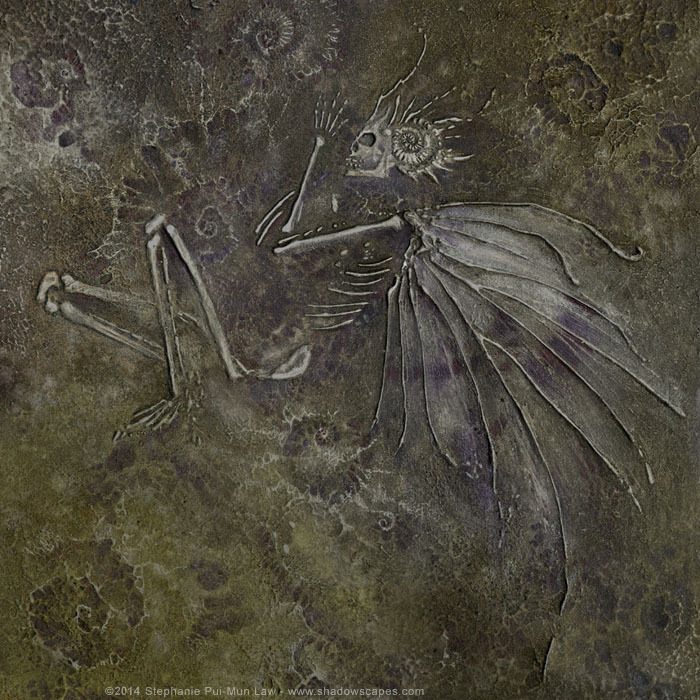 This nicely done fossilized fairy specimen comes to us from artist Stephanie Pui-Mun Law. ...with the bones of the skeleton then built up with gesso. 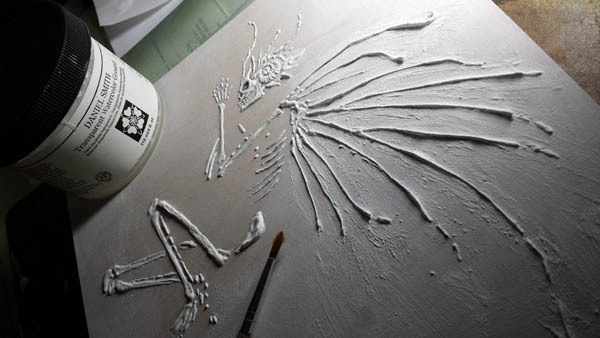 That simplified explanation leaves out the rather important step of capturing the shape of anatomically accurate bones using a semi-liquid medium. As with most things, the basic technique is easy. It's the execution that requires real artistic talent. 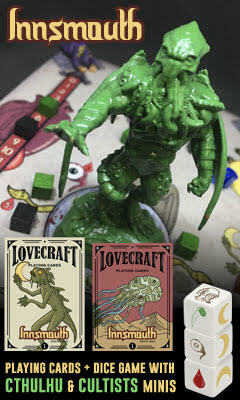 Alberto Cano of the Cthulhu Project has a new Kickstarter featuring some Mythos inspired playing cards and a fun little Cthulhu dice game. Admittedly, it's not the kind of thing I'm normally into, but he's my go-to example of someone who does Kickstarters right. Realistic goals, good production timelines, and, most importantly, a willingness to communicate when the inevitable glitches do pop up. 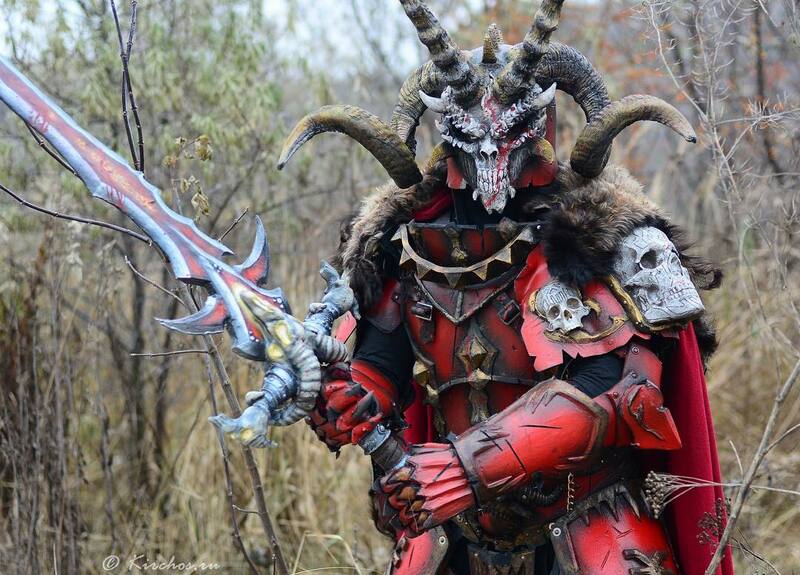 The artists at Brutal Forge bring us this very well done Warhammer LARP chaos warrior. Imagine: It's 1896, and the British Empire is at its height. In the recently acquired protectorate of Malaysia, British civilization is slowly taking hold in the tropical jungle at odds with centuries of native tradition. 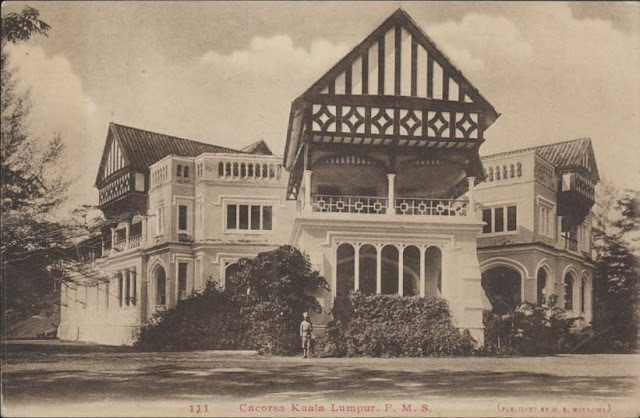 Sir Frank Swettenham, First High Commissioner of Malaysia, requests that a mansion be built for himself, and shortly thereafter it is constructed; a wild fusion of Gothic and Tudor styles sporting eight bedrooms, balconies, terraces, and columned arcades. As its name, Sir Swettenham gives it the title of... are you ready?... Carcosa. Here he quotes Cassilda's Song, and goes on to talk about how no other name seemed a better fit for a building as characteristically out of place as his Victorian mansion in the jungles of Malaysia. Today, this Estate is protected by the National Heritage Act of Malaysia and is operated (again, this creeped me out), as a wellness hotel offering "hospitality and high society living". Lastly, and this is the thing that drew it all together for me, is the logo of the Carcosa Seri Negara Estates; supposedly drawn to evoke "natural elements, the environment, and humanity." It's a sign, and it's yellow, and it creeped me out instantly. I am not making this up. There's a strange Victorian Estate in the heart of the Malaysia jungle, built by an eccentric British commissioner obsessed with the King in Yellow, named Carcosa, which is currently being run as a heath and wellness retreat for the wealthy and whose literal logo is a Yellow Sign! Is it the true form of the Yellow Sign? An artful coincidence? Something in between? It doesn't really matter, because either way this place is begging for coverage on your site, for its storytelling opportunities alone. 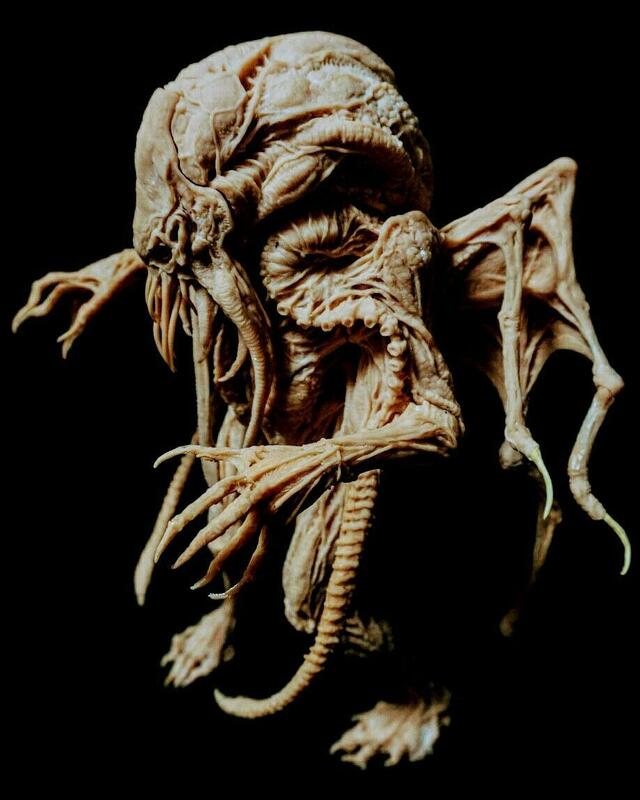 If only as an example of how close something can actually get to being Lovecraftian without actually going too far and saying it. I was happy and pleased and slightly unnerved by the whole affair, and I hope it has the same effect on you. When reality reads like a novel, that's what I look for in life. Serendipity or chance or whatever brought this thing about, it's just bursting with promise. I know your crowd of readers would be as equally pleased as I to learn this quaint little historical fact. I did not call the Resident General’s dwelling “Government House,” or “King’s House,” because neither seemed an appropriate name in Protected States. 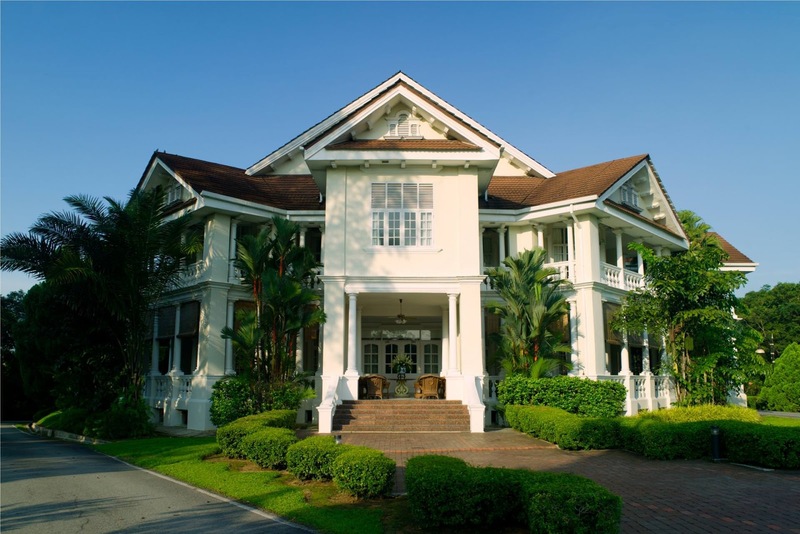 I did not give it a Malay name, because it was to be the residence of a British Officer; so I took a book name as has often been done before. As to the word Carcosa, I imagine it was the Castle of the King in Yellow, but the book explains nothing about either the place or its occupant. That apparently can be found in the play, to which there are only occasional allusions. Probably it is a word created by the author’s fancy, though it looks like a combination of the Italian words cara and casa and would mean “desirable dwelling,” as indeed I found it. 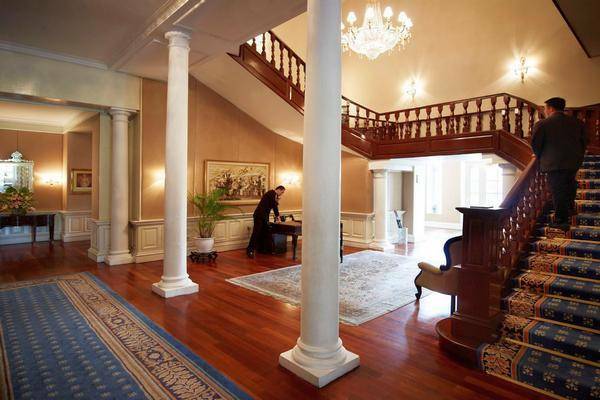 The dwelling itself is exactly the kind of grandiose, ornate building you would expect for a High Commissioner at the height of British colonial power. There's one architectural feature that immediately leapt out at me. It's particularly noticeable in a vintage postcard of the building showing the original paint scheme of the exterior woodwork. 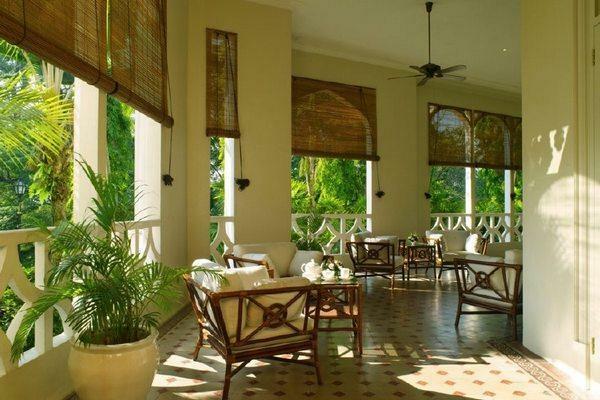 The rest of the structure has a wraparound veranda of conventional design, but this portico stands out. Surely I'm not the only one that sees a stylized skull bearing a crown. 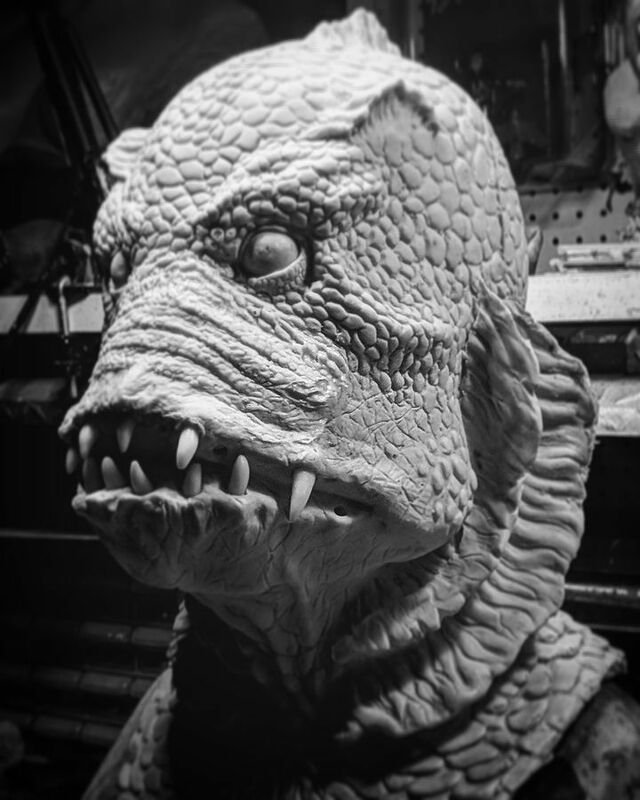 Artist Chris Williams brings us the first pull of his upcoming Deep One mask. I can't wait to see it painted up.